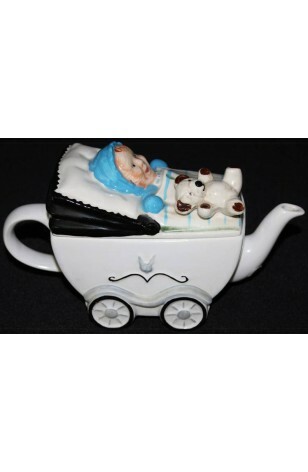 Vintage - Price-Kensington Potteries, Collectors Tea Pot, with Lid - "Baby in Carriage" Design, Hand Painted, Circa 1950. This is an absolutely Unique Design by Price-Kensington. A Collectors item for sure. In the Shape of a Baby Carriage holding a Smiling Baby and it's Teddy Bear. Hand Painted. Baby is wearing a Blue Bonnet and Mittens, and has Blue Eyes. The Blanket is Ivory with Blue and Green Strips, and he Teddy Bear is Beige. with Dark Brown Ears and Paw's. Decoration on the Side of the Carriage is Rabbits Ears. Great Gift for a new Mother or Grandmother.... or fantastic for the Tea Pot Collector. In excellent condition. This is an absolutely Unique Design by Price-Kensington. A Collectors item for sure. In the Shape of a Baby Carriage holding a Smiling Baby and it's Teddy Bear. Hand Painted. Baby is wearing a Blue Bonnet and Mittens, and has Blue Eyes. The Blanket is Ivory with Blue and Green Strips, and he Teddy Bear is Beige. with Dark Brown Ears and Paw's. Decoration on the Side of the Carriage is Rabbits Ears. Great Gift for a new Mother or Grandmother.... or fantastic for the Tea Pot Collector. In Very Good Resale Condition unless noted below or in pictures.